In her basement office at USC’s Brain and Creativity Institute, Lisa Aziz-Zadeh is poring over the latest batch of brain scans. 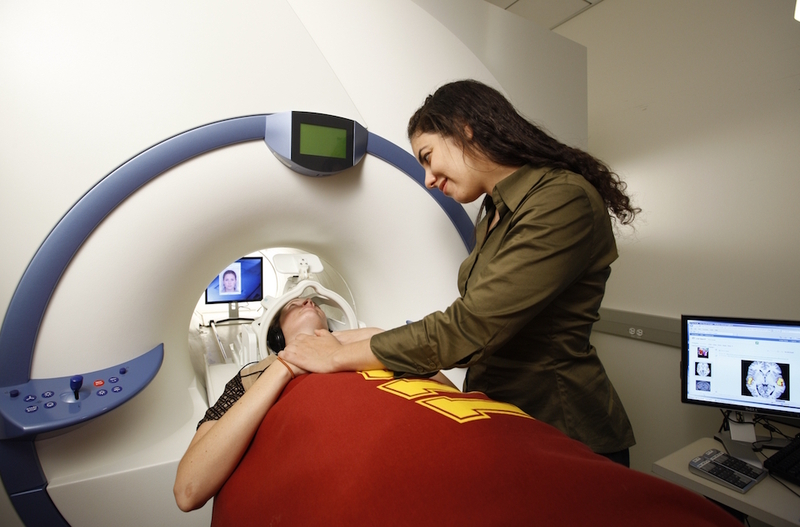 The scans are taken from a functional Magnetic Resonance Imaging, or fMRI, machine located at the Institute, and they provide a snapshot of the human brain in action. Like a mindreader, fMRI scans show changes in blood flow to different regions of the brain, giving scientists like Dr. Aziz-Zadeh insight into how the brain is working on a moment by moment basis in response to particular stimuli. The moments that are especially intriguing to Dr. Aziz-Zadeh, and which have her full attention today, are those moments translated into functional brain images captured while research subjects are busy watching videos of ordinary people performing ordinary occupations. But the lives of her research subjects are far from ordinary. They have all sustained a Cerebrovascular Accident, or stroke, the leading cause of physical disability in the world today. Lisa Aziz-Zadeh, Ph.D., is a cognitive neuroscientist by training. After com- pleting her undergraduate education and earning her Ph.D. in psychology from the University of California, Los Angeles, she went international for her postdoctoral studies. But she eventually returned back to Southern California to call on Antonio Damasio, Ph.D., M.D., one of the world’s foremost neurobiologists, and David Dornsife Chair in Neuroscience and Professor of Psychology and Neurology and Director of the USC College Brain and Creativity Institute. It was through fortuitous circumstances that Dr. Damasio eventually referred Dr. Aziz-Zadeh to Florence Clark, Ph.D., Associate Dean and Chair of USC’s Division of Occupational Science and Occupational Therapy. Before long, Dr. Aziz-Zadeh received joint appointments as Assistant Professor in both the Brain and Creativity Institute and the Division. Studying the inner workings of the human brain and its relationships to the outward, behavioral expressions which it manifests is an everyday occurrence at the Brain and Creativity Institute, and today is just like any other ordinarily extraordinary day. Dr. Aziz-Zadeh was recently awarded a nearly quarter million dollar, two year American Heart Association (AHA) grant entitled “The Mirror Neuron System (MNS): A Neural Substrate for Methods in Stroke Rehabilitation”. It’s the reason why she’s now looking at fMRI images of the brains of people who have had a stroke. Mirror neurons are cells in the brain that activate equally, whether performing an action or watching another perform the same action. For example, mirror neurons fire as equally when lifting your arm as they do when simply watching another person lift their own arm. Mirroring is also believed to be the way in which the brain seems to automatically interpret others’ intentions, actions and emotions. These specialized cells were discovered over a decade ago when Italian researchers accidentally found that sensors attached to the motor cortices of test monkeys seemed to record muscle activity even when the monkeys were sitting still, simply watching other primates move. Aziz-Zadeh hopes there is enough overlap provided by mirror neurons that, despite lesions to the brain, simply watching another’s movements can enhance motor recovery in people who have sustained a stroke. Dr. Aziz-Zadeh completed her post-doctoral training at the laboratory of Dr. Giacomo Rizzolatti at the University of Parma, in Italy. That name may not ring a bell for many occupational therapists, but to cognitive neuroscientists, Rizzolatti is a pioneer in what has become over the past several decades one of the most discussed topics in cognitive and neuroscience research. Dr. Rizzolatti and colleagues discovered what they termed “mirror neurons”. Mirror neurons are essentially a class of specialized brain cells that are theorized to “mirror” the typical electrical activity of motor neurons, firing both when a person is performing an action as well as when the person watches it being performed by others. The implications of the discovery of mirror neurons are tremendous. Since their discovery, motor neurons have been hypothesized to undergird nearly all human behaviors, including language, motor control and development and social interactions such as empathy and altruism affected by autism. When occupational therapists hear the word “mirror” in the context of therapeutic treatments, the typical connotation is most likely the use of mirrors to treat phantom limb symptoms of people who have sustained an amputation. The research that Dr. Aziz-Zadeh’s laboratory will produce may eventually start to change all that. An expert in the mirror neuron system, she has applied her knowledge to such diverse research topics as language, the “aha!” moments of insight and social interactions. But with this recent AHA grant, her research on the mirror neuron system may have the potential to impact occupational therapists’ models for providing rehabilitative therapy more than ever. The research funded by this new grant aims to better understand how individuals with stroke process motor actions. In particular, Dr. Aziz-Zadeh is exploring the impact that the lesions caused by stroke have on mirror neuron function. She wants to see how much overlap exists between the activities of similar brain regions when the stroke survivors make an action, versus when they only observe someone else making the action. The study will be examining both movements that the stroke survivor can and cannot perform as a result of the functional motor impairments caused by the stroke. The fMRI scans will allow her and her laboratory’s research team, which includes two of the Division’s Occupational Science Ph.D. students, Lei Liew, M.A.’08, and Julie Werner, M.A.’08, to visualize which brain regions are active when individuals with stroke make an action. The team can then see if and how much these neural regions overlap with the regions activated when watching other people make actions that they themselves either can or cannot perform. The team is a long way away from even suggesting any research findings, outcomes or implications. But if the mirror neuron system is indeed as powerful as many scientists hope that it is, it may one day be used to supplement the traditional, hands-on rehabilitation that occupational therapists provide across practice settings today. 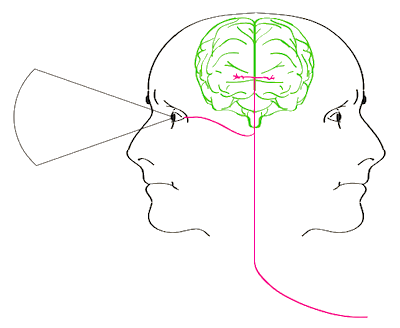 Because if mirror neurons fire equally when an individual moves and observes, and this holds true for populations with motor or neurological deficits such as those caused by stroke, then it is speculated that motor neuron activation and recovery post-stroke may be possible simply by watching the movements performed by others. One day, this type of “action observation” therapy could allow for individuals and trained caregivers to self-provide therapeutic interventions in their own homes and their own communities. After completing their expected three hours of outpatient rehabilitative therapy, patients could hypothetically go back home, pop a DVD or VCR of recorded actions and occupations into the home video player, and quite literally watch their way to functional motor gains. 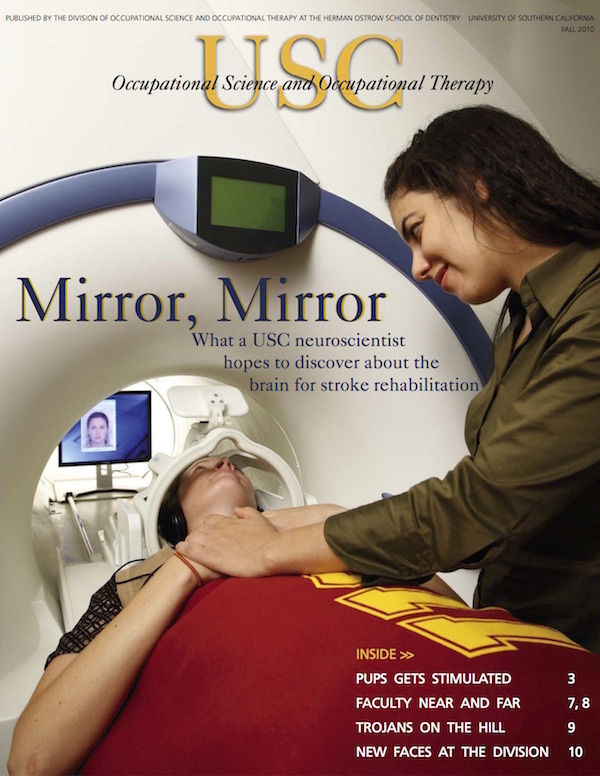 Whatever she eventually discovers about the mirror neuron system and its implications for occupational therapy, Dr. Lisa Aziz-Zadeh knows that the future of both scholarly research and clinical practice professions will be defined by the success of interdisciplinary relationships built on a foundation of basic research. Some occupational therapists may hear the word “neuroscience” and shudder. After all, many occupational therapists chose to enter the profession out of equal appreciation for the social and biological sciences. But Dr. Aziz-Zadeh invites occupational therapists to appreciate neuroscience as foundational to the core of what it means to be human. “All of human behavior, everything we do, is driven by neural activity,” she proclaims. “Understanding it will undoubtedly make our work, whether it be as neuroscientists or as occupational therapists, even that much better”.